One of the world’s least known metals is also of great importance, and likely to become more so as renewable energies catch up with and possibly eclipse fossil fuels. Yet vanadium’s primary use as a steel alloy is set to keep prices buoyant and North American explorers racing to find a domestic source of the metal that was once used to make swords so strong and sharp the mere sight of them struck fear into the hearts of their enemies. A sword of Damascus steel – derived from blocks of “wootz”, a form of steel produced from vanadium-rich iron deposits in South India – was said to be so sharp that it could split a hair dropped on the blade, cut a floating feather in half, or crack a steel helmet wide open with ease. The blades were so flexible they could bend 90 degrees without breaking. First discovered in 1801 by a professor of mineralogy in Mexico City, vanadium, whose symbol V is based on the Norse goddess Vanadis, has some rare qualities that give it the ability to make materials stronger, lighter, more efficient and more powerful. Adding small percentages of it to steel and aluminum creates ultra-high-strength, super-light and resilient alloys. Just two pounds of vanadium added to a tonne of steel doubles its strength, so it is unsurprising that 80% of vanadium is used to make ferrovanadium – a steel additive. 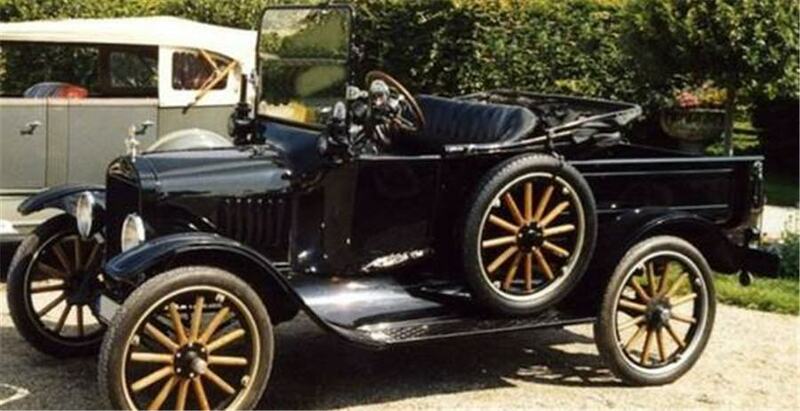 Henry Ford was the first to use vanadium on an industrial scale, in the 1908 Model T car chassis. But it is only recently that auto makers have discovered that adding vanadium to car bodies makes them lighter and stronger. Twenty years ago no vanadium went into cars, versus around 45 percent today. By 2025, it’s estimated that 85 percent of all automobiles will incorporate vanadium alloy to reduce their weight, thereby increasing their fuel efficiency to conform to stringent fuel economy standards set by the US EPA. Who would have thought any material could make steel ‘greener’? Vanadium’s corrosion-resistant properties make it ideal for tubes and pipes manufactured to carry chemicals. Vanadium-titanium alloys have the best strength-to-weight ratio of any engineered material on earth. Less than one percent of vanadium and as little chromium makes steel shock and vibration resistant. A thin layer of vanadium is used to bond titanium to steel, making it ideal for aerospace applications. Mixing titanium with vanadium and iron strengthens and adds durability to turbines that spin up to 70,000 rpm. Since vanadium does not easily absorb neutrons it has important applications in nuclear power. Vanadium pentoxide (V2O5) permanently fixes dyes to fabrics. Vanadium oxide is utilized as a pigment for ceramics and glass, as a chemical catalyst, and to produce superconducting magnets. “This is a market that should, by all reasonable practical means, grow over the next five to 15, maybe 20 years, as we get more and more into decentralized electrical generation. And the vanadium redox flow battery will definitely fit into that category,” said John Priestner, President and CEO of Vanadium One Energy Corp (TSX.V:VONE, Frankfurt:9VR1) in a recent talk with Aheadoftheherd.com. Vanadium One’s Mont Sorcier Vanadium Project is considered one of the largest and one of the highest grade sources of North American vanadium under development. About 85 percent of the world's vanadium comes from three source countries: South Africa, China and Russia. Vanadium is typically found within magnetite iron ore deposits, and is usually mined as a byproduct and not as a primary mineral. Vanadium is often agglomerated with titanium, which must be separated out as an impurity during processing. The higher the titanium content in the ore, the harder it is to remove the vanadium. The end product is vanadium pentoxide, which can be used for the applications cited above or to make ferrovanadium for use in steel. 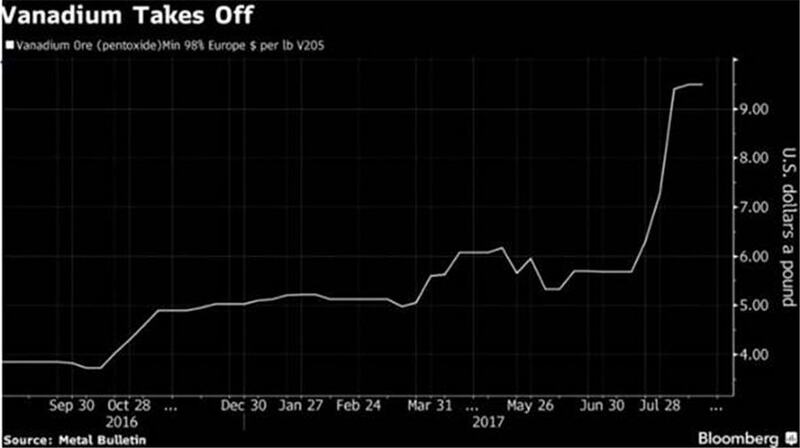 While V2O5 currently sells for between US$16,000 and US$17,000 a ton, titanium goes for just $US1,500 a ton, which means a low grade of titanium is an attractive feature of a vanadium prospect. Some of the world's key vanadium mines include the Bushveld complex in South Africa – responsible for about a quarter of all vanadium supply; the high-grade Maracas mine in Brazil owned by Largo Resources; and EVRAZ’s Vanady Tula mine in Russia, the largest European producer of vanadium pentoxide and ferrovanadium alloys. The world needs more steel, ergo, more vanadium. The latest estimate is that vanadium demand and supply currently intersect at about 80,000 tonnes per year. 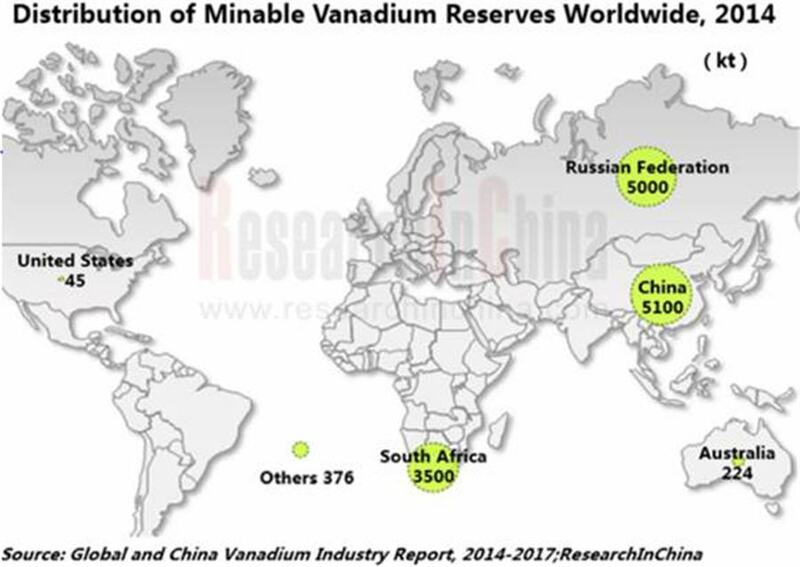 Market research firm Roskill predicts that by 2020 there will be about a 45 percent increase in the demand for vanadium, driven mostly by China. As an example of how much steel will be required to build just one new Chinese city – Xiong'an, consider that the city will likely need 20 to 30 million tonnes of steel, which translates to 30,000 tonnes of vanadium – roughly a third of current annual production, albeit over 10 years. That means 3,000 additional tonnes of vanadium a year for the next decade, for just one city – an increase of 5 percent above current supply and demand. Another thing going for vanadium is China's reluctance to manufacture low-quality rebar used in building construction. Recent earthquakes in China and Japan have shown the Chinese that using cheap rebar is penny wise and pound foolish. “They're increasing the amount of vanadium in the rebar by about 100 percent so that they can end up with structural specifications that are necessary to keep buildings standing for long periods of time. The rebar alone, that's estimated to bring another 10,000 tonnes a year of vanadium demand,” said Priestner. China’s scrap ban will cut 4,500-5,500 tpy of domestic V2O5 production. The increased use of vanadium in automobiles is worth re-iterating. Auto makers have discovered that adding vanadium to car bodies makes them lighter and stronger. Twenty years ago no vanadium went into cars, versus around 45 percent today. By 2025, it’s estimated that 85 percent of all automobiles will incorporate vanadium alloy to reduce their weight, thereby increasing their fuel efficiency to conform to stringent fuel economy standards set by the US EPA. Chinese infrastructure investments in the New Silk Road – a $900-billion project set to open up land and maritime routes between China and its western neighbors, namely Central Asia, the Middle East and Europe – is another massive spend on steel that will inevitably require more vanadium than is currently being mined. Then there are the new infrastructure demands in the United States that President Donald Trump campaigned on in 2016 and is promising to address. The state of disrepair of much of America's infrastructure is truly staggering. It's estimated that 80,000 bridges, or over half the entire stock of U.S. bridge structures, need to be repaired or replaced. Whether or not Trump's infrastructure bill is passed, there will certainly be a future need for more U.S. steel, and more vanadium. In March and April of 2017, electricity produced from utility-scale renewable sources exceeded nuclear power generation in the United States for the first time since 1984. It’s also worth mentioning that besides v-flow batteries, vanadium has also begun to play a role in applications for electric and hybrid vehicles. Vanadium acts as a supercharger for batteries by increasing the energy density and voltage of the battery. This is important for electric and hybrid vehicle performance since energy density equates to range, while voltage equates to torque. With vanadium demand set to soar, it is a valid question as to where new vanadium supply will come from. There are currently no North American reserves, a situation that is and should be deeply alarming to politicians on both sides of the 49th parallel. 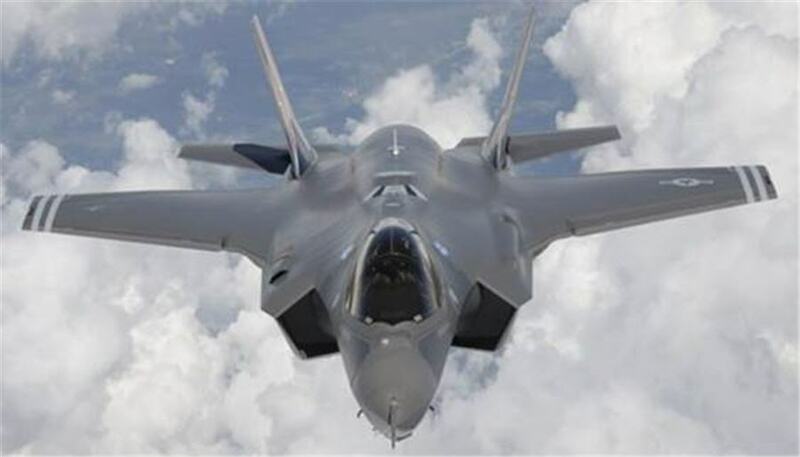 A critical or strategic metal is defined as one whose lack of availability during a national emergency would affect the economic and defensive capabilities of that country. The United States and Canada, are completely dependent on recycling (mostly through recovery from spent catalyst from oil refining operations) and imports for 100% of their vanadium supply. Consider what happened to the rare earths market in the 2000s, when China, which produces 90 percent of REEs, restricted exports, causing prices to spike around the world. Rare earths are used in everything from cell phones to wind turbines to missile guidance systems. With just three countries – South Africa, China and Russia – controlling the supply of vanadium, there is a high risk of that supply either being cut off due to a political or trade conflict, or for the price to suddenly jump. “Forget about the infrastructure that we need. I'm talking about just the security of North America. Without vanadium, you won't be making very many armor-plated tanks and aircraft and all the rest of it. We have no source of supply in North America,” Priestner said. The current tensions between the United States and North Korea are a perfect example of a situation where without vanadium, North America has no missile defense shield. Tensions are running high between Russia, NATO and the Trump administration. China/U.S. tensions, and trade threats receive headlines weekly. ‘Forever War’ seems to be the norm in many parts of the world as global infrastructure receives a ‘D’ ranking after ranking. South Africa looks set to become a resource extraction basketcase, a ‘has been’ with the left hand not knowing what the right is doing in regards to BEE and new mining regulations. While v-flow batteries have tremendous appeal for harnessing the power of the wind and sun, their mass adoption so their direct application to the supply-demand equation for vanadium is probably a few years off. New technologies take a long time to be proven out, tested and adopted by the mainstream. And that’s probably just as well, because vanadium suppliers simply won’t be able to keep up with the amount of demand that is coming down the pipe for the 22nd most abundant element. Think back to that single Chinese city being built – over a third of the world’s vanadium production over the next decade going into one city. That isn’t counting the expected increase in vanadium needed for steel production, defense, automobiles, aerospace, rebar and all the other vanadium applications. The answer is to bring new vanadium mines online – especially North American deposits that can produce vanadium pentoxide and ferrovanadium, thus bringing the supply-demand curve down to a point where the price is attractive for both vanadium producers and consumers, while increasing security of supply in an increasingly hostile world. Because vanadium is a metal that seems destined for a supply crunch, because of its applications for traditional industries like autos, aerospace, defense and steelmaking, and due to its promising potential for long-term battery storage of grid-scale electricity, companies that are developing vanadium deposits in North America need to be on your radar screen. Richard owns shares of Vanadium One Energy Corp (TSX.V:VONE, Frankfurt:9VR1 ), and VONE is an advertiser on his site.